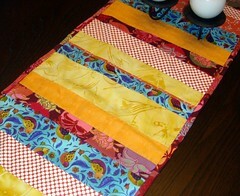 A table runner for my brother and his wife (which still has to be sent ... I'm pretty sure they don't read my blog though ... well, if they do then Merry Christmas to them). I really am not sure what their style is ... or even the colors of their dining room as I've only been to their house once ... but the blue bird fabric reminded me of a bedcover they'd bought a few years ago for their master bedroom ... so I'm hopeful that this will work for them. 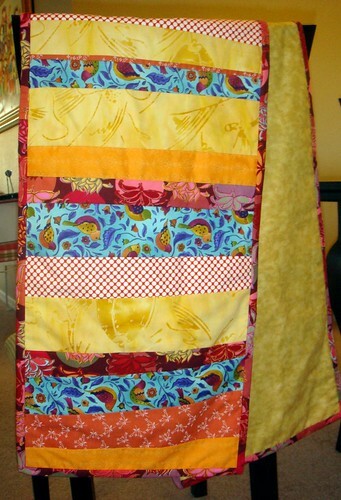 My sister told me to go with neutral solids but because I mostly sew stuff for kids I have lots of bright colorful busy fabrics, not so much that is neutral and solid. I did the best I could to at least work with what I think are the colors of their home. 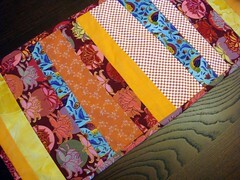 The table runner measures about 12" by 70". The strips are varied in width and are slightly assymetrical. I pieced them onto muslin, which nicely added another layer of thickness ... good both for stability and if hotter items are placed on the runner. Happy New Year to all. May your year be filled with love and peace. Lovely!! Absolutely gorgeous! Such very pretty colors. It is just stunning and not to bright at all. Simply eye catching and beautiful. Looks so nice on your table. My daughter so enjoyed opening the quilt I bought for her for Christmas that you made this year. She has it draped over a chair in her living room and reminds her of my grandmother. Such happy memories. 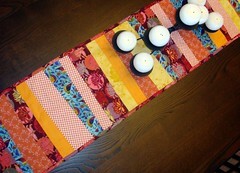 I really do favor table runners to table clothes so I LOVE this one. 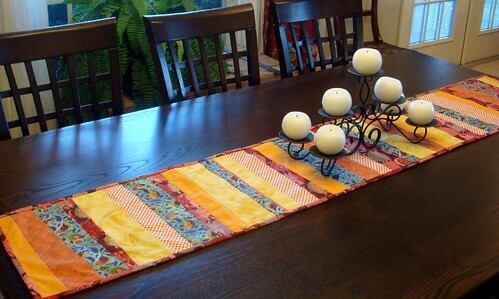 A great pop of color for any dining room. Looks great on your dark table too.